UK menswear retailer The Officers Club has gone into administration and 32 of its 150 shops will shut immediately, while the remainder have been sold. The retailer was put up for sale by administrators PricewaterhouseCoopers as it fell victim to the downturn. They said the 118 stores had been sold to TimeC 1215 limited, which is backed by David Charlton, chief executive of The Officers Club. He said the deal would protect the jobs of 900 people. The Officers Club was started in the early 1990s in Sunderland. It became one of the biggest retail companies in the UK with flagship stores in London's Oxford Street and north-east England. The firm's headquarters is at Cramlington, Northumberland. "We are very pleased to be able to secure this deal and protect the employment of over 900 people in the stores and head office," said Mr Charlton. "We welcome the opportunity to take the business forward and look forward to a successful future." 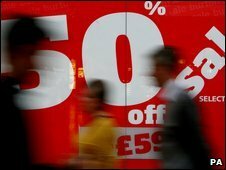 Insolvency experts are warning that more than 10 national or regional retail chains risk going bust next month. Retailers are vulnerable in January because they generally have more cash and less stock than at any other time of the year, so if creditors are going to force them into administration it is the best time to do so. It has already been a tough few months for well-known retailers, with MFI already having closed down and Woolworths due to shut its shops in January. On Tuesday, The Whittard of Chelsea chain of shops was sold to a private equity firm after going into administration.